The SVGA-resolution ViewSonic PJD2121 is the perfect projector when you need a small, lightweight package but a pocket projector just won't cut it. This projector is truly small: You could fit two of them on a sheet of letter-sized paper with room to spare and each one weighs only 2.16 pounds. Yet the PJD2121 has big projector features that pocket projectors just can't match. It's got 400 lumens of projection power at a contrast ratio 1800:1. And it puts out a gorgeous, vivid image thanks to its 0.55 inch Texas Instruments Digital Micromirror Device Digital Light Processor (DMD DLP) with BrilliantColor. That's the same size image panel found on many larger projectors. BrilliantColor increases color accuracy while it increases color brightness by up to 50 percent. And in addition to red green and blue, its spectrum includes their complements: cyan, magenta and yellow. As a bonus, DLP projectors require no filters that have to be periodically cleaned and replaced. ViewSonic's exclusive ViewMatch feature allows you to make quick color corrections using the remote control. The PJD2121's short throw lens makes it ideal when you need a large image in small room. Imagine showing a 60" diagonally measured image from just four feet away. This projector can do it. It can also show 720p and 1080i high definition images through its component input. With the PJD2121's Off-to-Go feature you can just unplug the projector and be on your way when your presentation is over. There's no need to hang around making small talk while the projector lamp cools down. You'd expect nothing less from a projector this cool. A rating of 400 hundred lumens isn't as low as you might assume. Brightness perception is logarithmic. To keep you from scurrying to find a high school math book we'll explain that it means this projector would seem to be about half as bright as one that put out a very respectable 4000 lumens. And with an 1800:1 contrast ratio that's pretty impressive for a projector that weighs about two pounds, isn't it? At just 8.1 x 2.6 x 4.7" and 2.16 pounds the PJD2121 is one of the smallest fully-featured projectors available. Just slip it into your briefcase or handbag and you're good to go. The panel is the part of the projector that forms the image. 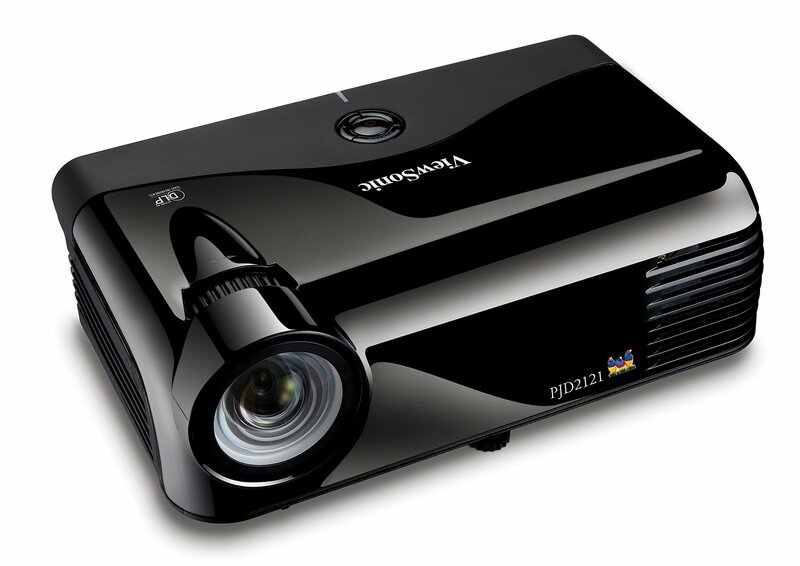 Many larger projectors use a 0.55 inch-sized panel. Unlike other technologies such as LCD which use just three primary colors (red, green and blue) to produce the image, DLP Technology with the BrilliantColor in the PJD2121 uses six separate colors (RGB plus cyan, magenta and yellow). You can make color adjustments from the remote control for quick and accurate color corrections. The PJD2121 can not only scale PC and Macintosh images up to SXGA (1280 x 1024), it can also handle both 720p and 1080i high definition images via its component video port. Recommended Projection Size 35 – 150"
Certified Factory Recertified, 90 days limited warranty on parts and labor.